As expected the team behind the OLO smartphone 3D printer has this week launched their new system via Kickstarter and have already blasted past their $80,000 pledge goal thanks to over 2000 backers. Who have helped the team raise more than $250,000 in its first hours since launch with still 29 days remaining on their campaign. As mentioned in our earlier article featuring the smartphone 3D printer, the OLO has been designed to use your smartphone as the processing power, and makes 3D printing easy and accessible for everyone, say its creators. Watch the promotional video below to learn more about the OLO Smartphone 3D printer and its features and functionality as well as the inspiration behind using a smartphone to power it. Its developers explain a little more about its features and functionality. Simple and affordable, OLO uses the light from your smartphone’s screen to print 3D objects. You can take OLO anywhere. Truly compact and light, it fits in any bag or backpack. You can even bring OLO with you while traveling; including onboard a flight! OLO works with smartphones of almost any size or brand. Even large 5.5 inch displays such as iPhone 6S+ or Galaxy A7. 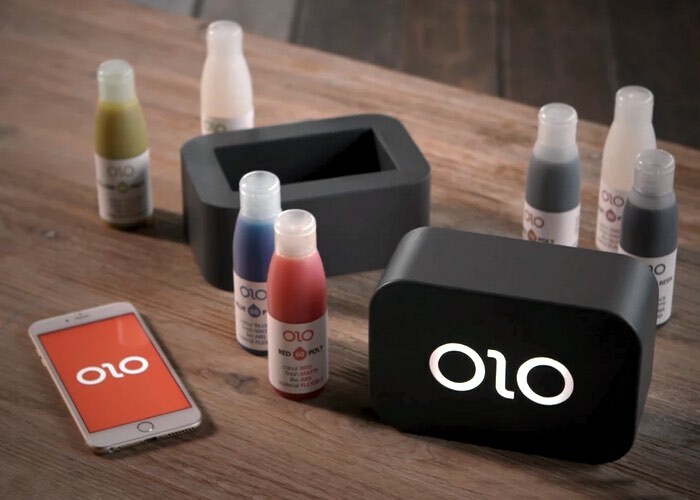 Regardless of brand or size, OLO can turn your phone into a 3D printer! We made OLO available for almost any device. All you need is a flat touch screen smartphone. OLO’s building chamber was designed to prevent light penetration in order to maximize the effectiveness of the white light emission from your smartphone’s display. You can use any 3D scan software, including Autodesk 123D Catch. For more information on the new OLO smartphone 3D printer jump over to the Kickstarter website for details and to make a pledge from just $99.